Introduction: Emergence from general anaesthesia can be complicated by the presence of agitation in children and thus presents a challenging situation for postanesthesia care providers. Several factors are associated with emergence agitation (EA). These include pain, preoperative anxiety, young age, poor adaptability, short time to recovery, among others. Objective: This study aimed to determine the effect of oral midazolam in preventing postoperative EA in children. Materials and Methods: This was a case–control study carried out among 80 healthy children aged 1–10 years scheduled for day-case surgery. The children were randomly assigned to receive either a syrup of paracetamol 10 mg/kg with injectable midazolam 0.5 mg/kg added to the syrup (Group A) or a placebo in the form of paracetamol syrup (Group B) at a dose of 10 mg/kg 30 min before induction of anesthesia. Patients' state of agitation was assessed every 5 min for the 1st h by means of an EA scale. Children with an agitation score of 3 or 4 were classified as agitated. Prolonged agitation was defined as a score of ≥3 lasting 15 min after arrival in the recovery room. Data were analyzed using the Statistical Software for Social Sciences version 20. Results: Eighty children aged 1–10 years were enrolled in the study. Majority of the procedures were circumcisions (48.75%), while urethral dilatation, examination under anesthesia, and tongue release were the least (1.25%). There was no statistically significant difference in the agitation state of the two groups (P = 0.60). Conclusion: Premedication with oral midazolam 0.5 mg/kg administered 30 min preoperatively does not prevent EA in all cases. Emergence from general anesthesia can be complicated by the presence of agitation in children and thus presents a challenging situation for postanesthesia care providers. Postanesthetic excitement, emergence delirium, and emergence agitation (EA) are terms used interchangeably to describe this acute phenomenon. This agitation is characterized by a change in perception of the environment with signs of disorientation, hypersensitivity to stimuli, and hyperactive motor behavior. In addition, paranoid ideas have been observed in combination with these abnormal emergence behaviors in the school-age group. Although generally self-limiting, EA can be severe and may result in physical harm to the child. Severe EA may require pharmacological intervention, resulting in a prolonged stay in the postanesthesia care unit (PACU). In rare cases, agitation and restlessness associated with EA have lasted for longer than 2 days. The long-term psychological implications of EA remain unknown. Early epidemiologic study demonstrated a 5.3% incidence of EA in all postoperative patients with a more frequent incidence in children (12%–13%). This phenomenon has been associated with specific anesthetics, in particular sevoflurane, a variety of perioperative medications, pain and patient-related factors.,,, Other factors associated with EA include preoperative anxiety young age, no previous surgery, poor adaptability, ophthalmic/ENT procedures, sevoflurane, isoflurane, analgesics administration, and short time to awakening. Other investigators have argued that pain during impaired consciousness contributes to severe EA in children., The administration of ketorolac, acetaminophen, tramadol, or fentanyl has been shown to reduce the agitation associated with sevoflurane anesthesia in children undergoing ENT surgery, thus suggesting a potential relationship between pain and EA. However, Murray et al. demonstrated that preemptive oxycodone reduces postanesthesia agitation in children who had received halothane but not for those who received sevoflurane. Another study has demonstrated a clinically significant incidence of EA in presumably pain-free patient. This suggests that analgesics cannot completely attenuate postanesthesia agitation. EA is usually self-limiting. However, an understanding of potential risk factors is important to appropriately differentiate and treat agitation in the pediatric PACU. Severe agitation requires parental presence as well as pharmacological intervention, which might prolong stay in PACU. As the etiology of EA is unknown, a clear strategy for the prevention and treatment has yet to be developed. This led to the use of varieties of medication, including alpha-2 agonist, opioids, and sedatives with various success. According to the literature, alpha-2 agonist appears to be the group of drugs most effective for the prevention as well as treatment of EA. In addition, they are being used in pediatric with an ever-widening range of indications, such as, for example, premedication, adjuvants for central and peripheral blockade, analgesic for intrathecal perfusion, and for the control of withdrawal symptoms and tolerance of other sedatives. Clonidine is one of the most common alpha-2 agonist used for this purpose. It has analgesic, sedative, and anxiolytic properties. It can be administered through various routes such as intravenous (IV), intramuscular (IM), PO, PR, and intrathecally. The study of Tesoro et al. showed that clonidine at the dose of 2 μg/kg IV effectively prevented and treated EA in 169 pediatric day-case surgeries. This dose is however associated with greater postoperative somnolence but with no observable adverse cardiorespiratory events. Among the opioids, fentanyl is widely used and seems to be effective in most patients with EA. It is a synthetic opioid analgesic drug which is 100 times more potent than morphine. It can be given through IV, IM, intrathecal, and transdermal routes. Onset of action is 1–2 min after IV injection, and peak effect is seen within 4–5 min. Cohen et al. found that IV 2.5 μg/kg of fentanyl successfully prevents and treats EA associated with desflurane anesthesia. There is, however, the need to administer fentanyl with an antiemetic to prevent nausea and vomiting. Tramadol is another opioid which was tried with no success in the treatment of EA. There have been attempt to use pentazocine as premedicant to prevent and treat EA. However, it confers no advantage over standard drugs and is generally only used when other drugs are not available. Furthermore, the antianalgesic property of pentazocine placed it at a disadvantage. Chen et al. compared the effect of midazolam, propofol, and ketamine in reducing EA following cataract surgery in children. They found that midazolam and propofol significantly reduced agitation compared to ketamine. Similarly, Ko et al. studied the incidence of EA in children following midazolam premedication. They discovered that compared to those who received placebo (oral normal saline), children who received midazolam were significantly less agitated. Sevoflurane was used as anesthetic in both of the studies. Unlike the above studies, Cohen et al. discovered that midazolam does not reduce EA in children who had adenotonsillectomy. However, desflurane was used in their study. This prospective randomized study therefore examined the impact of oral midazolam premedication on EA in pediatric surgical day cases. Specifically, it sought to test the hypothesis that preoperative sedation lessens EA. Following approval by Hospital Ethical Committee '(AKTH/MAC/SUB/12A/p3/IV/445) dated 1st February 2008' and with parental informed consent, eighty healthy children (ASA I and II), aged 1–10 years scheduled for day case surgery at the study center were recruited into the study. All the procedures have been carried out as per the guidelines given in Declaration of Helsinski 2013. The cases were for mainly body surface surgeries not exceeding 1 h. The exclusion criteria were children with central nervous system, respiratory, gastrointestinal, and cardiovascular disorders. Also excluded were children taking sedatives, anticonvulsants, and those with known hypersensitivity to midazolam. Similarly, patients who refused to take or who vomited the premedication and those that needed invasive airway management were excluded. Patients included in the study were reviewed by one of the researchers who is an anesthetist. The children were assigned by random selection using precoded slips to receive either a syrup of paracetamol 10 mg/kg with injectable midazolam 0.5 mg/kg added to it (Group A) or a placebo in the form of paracetamol syrup (Group B) at a dose of 10 mg/kg 30 min before induction of anesthesia. Paracetamol serves as palatable medium for midazolam as well as an analgesic. The randomization slips were prepared and executed on each operation day by an independent anesthetist. 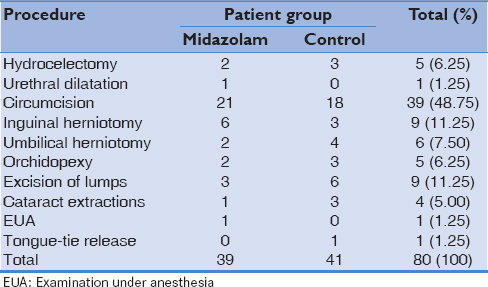 The paracetamol syrup (10 mg/kg) and midazolam (0.5 mg/kg) preparations were prepared freshly on the morning of surgery according to the weight of each patient in the midazolam group (Group A) by the nurse of the day care ward. Group B received 10 mg/kg paracetamol syrup on the morning of surgery. The protocol anesthetist was one of the researchers, and all the recovery room nurses who did the assessment postoperatively were put through the method of assessment. The nurses and the anesthetist were blinded to the drugs administered until when the patients are discharged from the recovery room. No patient was accompanied by the parents into the induction room. Before induction routine, baseline blood pressure, pulse rate, and arterial oxygen saturation were recorded and subsequently monitored every 5 min until the end of surgery. Anesthesia was induced with halothane 1–2 vol% in 100% oxygen at 6 L/min through a face mask using a Jackson–Rees modified Ayre's T-piece for patient weighing <25 kg and a Bain's circuit in those weighing >25 kg. At induction, the acceptability of mask induction was assessed by the anesthetist using the mask induction assessment scale. Appropriate size venous cannula was inserted into the dorsum of the hand as soon as the patient was under anesthesia as there was no EMLA or AMETOP cream available in our hospital. Intraoperatively, 4.3% dextrose in 0.18% saline administered at the rate of 5 ml/kg/h through a gravimetric set (soluset) was used for fluid management. Anesthesia was maintained with halothane as appropriate (1%–1.5%) in 100% oxygen through a facemask or laryngeal mask airway depending on the surgical procedure. The percentage of halothane was adjusted to maintain an adequate surgical plane of anesthesia. All patients were allowed to breathe spontaneously. Analgesia was provided with ring block for circumcision, peribulbar block for cataract, lidocaine gel for urethral stricture, and by local infiltration of wound incision site with 2% plain lidocaine (3 mg/kg) for other surgeries immediately after induction. All the blocks were instituted by the surgeons. Surgery was allowed to commence 5 min after local anesthetic infiltration. Surgery time was considered as the interval between skin incision and the time of the last stitch. Anesthesia time was the time frame between induction and the return of protective reflexes (cough and swallowing). At the end of the surgery, patients were taken to the recovery area awake requiring no airway device. Blood pressure and pulse oximetry monitoring were continued, and the state of agitation was assessed every 5 min for the 1st h by means of an EA scale. Children with an agitation score of 3 or 4 were classified as agitated. Prolonged agitation was defined as a score of ≥3 lasting 15 min after arrival in the recovery room. Children with agitation scores of three and above were restrained, and their parents were allowed into the recovery room to pacify them. IV pentazocine 0.5 mg/kg was given through the indwelling cannula when found necessary. Data analysis was done using SPSS statistical software version 20 (IBM), and P < 0.05 was taken as statistically significant. Eighty children were enrolled in the study after obtaining an informed consent. None of the children was excluded from the study based on the exclusion criteria. Sixty-five patients were ASA I while fifteen were classified as ASA II. The age and weight distribution of the children in the two groups were not significantly different P > 0.05 [Table 1]. The surgical procedures performed on the patients were relatively similar in the two groups of patients. Majority of the cases were circumcisions (48.75%), while urethral dilatation, EUA, and tongue release represent the least (1.25%) [Table 2]. There was no significant statistical difference in the agitation state of the two groups. The overall incidence of EA in the study is 12.5% (10 out of 80). EA was about 4 times more common among the control (19.5%) compared to the Midazolam group (5.1%). However, this relationship was not statistically significant, P = 0.0883 [Table 3]. The mean agitation score of 3 is more in the age group of 1–5 years and less from the age of seven and above. Details are shown in [Table 4]. When the gender and the agitation state were compared, it was found that out of the ten children that had agitation score of 3, nine of them were males. Out of the ten children that had mean agitation score of 3, eight had circumcision, one had cataract extraction, and one had hydrocelectomy [Table 5]. There were no anesthetic complications during the course of the study. [Table 6] below shows the ten children that had a mean agitation score of 3 had a remedy in the form of parental presence or the administration of IV pentazocine. The agitation was ameliorated by parental consolation (80%) while the remaining had IV pentazocine as parental presence during agitation did not work (20%). Postoperatively, 97.4% of the patients in the midazolam group recovered fully and were discharged within 30–40 min postoperatively. One patient in the midazolam group had a delayed recovery and hence delayed discharge time from the PACU. There was no significant difference between the two groups of patients as regard the recovery and discharge time [Table 7]. EA, also referred to as emergence delirium, is a well-documented clinical phenomenon, particularly in children. It is characterized by mental confusion, irritability, disorientation, unconsolable crying, and increased recovery time. It can also lead to dislodgement of IV cannulae and disconnection of cables and monitoring instruments. Physical injuries might also occur in unrestricted and uncontrolled cases. Some patients might even manifest with behavioral changes weeks after surgery. There is no definitive explanation for EA. Factors reported to be associated with EA include anxiety or excitement at induction, multiple anesthesia, age (1–5 years), pains, surgical procedure, and specific agent (sevoflurane). The difficulty with establishing etiology explains the major variation in the incidence rates reported in the literature, which varies from 10% to 67%., Methods to ease the emergence include preoperative sedation, education, parental presence, and establishment of rapport. In this study, rapport was established with the patientsh but patient education was not done and parents were not allowed into the induction room. The overall incidence of EA after oral midazolam premedication in this study was found to be 12.5% [Table 3]. Which is comparable to the range quoted in the literature., About 5.1% of patients in the midazolam group had agitation compared with 19.5% of the patients in the control group. This means that there is far less EA in the midazolam group. However, P = 0.0833 indicates that there was no significant statistical difference between the midazolam and the control group. This lack of significant statistical difference might probably be due to the sample size. Or it might be that midazolam is not preventing the EA effectively. Therefore, there may be another factor other than midazolam (common to both groups) that may have contributed to this lack of difference between the two groups. This finding is similar to that of Cohen et al. who had earlier concluded from their study that the use of midazolam was not effective in preventing children from EA. The fact that midazolam does not prevent agitation was also supported by the study of Cole et al. which showed that children who receive midazolam experienced EA more frequently than those who did not. It is therefore not surprising that 5.12% of children in the midazolam group had EA. A similar study by Kain et al. also showed no statistical difference between the midazolam group and the control group even though they looked at the incidence of maladaptive behavioral changes. McGraw and Kendrick. in their study on oral midazolam premedication and postoperative behavior in children found that children premedicated with midazolam tend to more frequently exhibit adverse postoperative behavior. This study did not however follow-up the patients to find out if they developed postoperative behavioral changes at home. Failure of midazolam to significantly abolish EA may also be attributed to its relatively short half-life. The serum level of midazolam may probably be too low at the end of anesthesia to cause significant sedation adequate to reduce the incidence of EA. In an attempt to extend its sedative effect to the end of surgery and to improve on the emergence outcome, midazolam was combined with other drugs as premedication. Arai et al. found that a combination of midazolam with low dose (0.25 mg/kg) diazepam markedly improved the emergence outcome. The relatively slow onset and long duration of diazepam were probably responsible for this action. Furthermore, benzodiazepines (midazolam inclusive) have been associated with paradoxical reaction and agitation and that have been reversed with flumazenil. Cole et al. also found that children premedicated with midazolam exhibited increased incidence of EA than children who did not receive it, offering the antianalgesic effect of midazolam as an explanation. Pain is often described as a contributing factor to EA. It was believed that pain during impaired consciousness contributes to severe EA in some children. However, a clear relationship has not been established. Murray et al. demonstrated that preemptive analgesia reduced postanesthesia agitation in children who received halothane but not for those who received sevoflurane. Preemptive local anesthetic infiltration and syrup paracetamol with halothane anesthesia in this study may have contributed to the low incidence of EA observed. Several studies addressing EA as a postoperative complication in children have generally focused on the volatile anesthetics, particularly sevoflurane and desflurane.,, The reported incidence of emergence has ranged from 24% to 66% in children who received these agents. Halothane is least associated with agitation followed by isoflurane. There are suggestions that anesthetics with a low solubility are associated with an increased incidence of EA and may be related to a faster emergence from anesthesia. Arai et al. had suggested that for midazolam to significantly prevent or reduce EA, it has to be combined with an agent that will augment its sedative properties. Thus, in this study, halothane may have slightly augmented the sedative effect of midazolam and thereby reducing the EA. Age of the patient was also considered as contributing to EA. The greatest of EA after anesthesia was observed in the preschool age children, compared with school-age children. Studies have confirmed these results, and since then, the group that has received most research attention is that from 2 to 4 years., This finding is also consistent with the findings in this study which shows that most of the patients that had agitation were within the age range of 1–5 years [Table 4]. Surgical procedures were also considered as contributing to emergence. There are no recent data to help clarify this relationship. However, early anecdotal and descriptive reports suggested that emergence was encountered more frequently in young people who underwent tonsillectomy or head and neck surgery. [27,28] In this study, ENT surgeries were not done but one patient who had cataract extraction was agitated. Other studies speculated that a “sense of suffocation” may contribute to EA in patients undergoing head and neck procedures (ophthalmic inclusive), but there are no scientific data to support this. To confirm increase in EA in some type of surgical procedures, some research needs to be carried out in our environment. Premedication with oral midazolam 0.5 mg/kg administered 30 min preoperatively does not prevent EA in all cases. The study individuals had different surgical operations which might influence their postoperative agitation state. There is need to further study the relationship between surgical procedure and agitation. Wells LT, Rasch DK. Emergence “delirium” after sevoflurane anesthesia: A paranoid delusion? Anesth Analg 1999;88:1308-10. Holzki J, Kretz FJ. Changing aspects of sevoflurane in paediatric anaesthesia: 1975-99. Paediatr Anaesth 1999;9:283-6. Veyckemans F. Excitation phenomena during sevoflurane anaesthesia in children. Curr Opin Anaesthesiol 2001;14:339-43. Voepel-Lewis T, Malviya S, Tait AR. A prospective cohort study of emergence agitation in the pediatric postanesthesia care unit. Anesth Analg 2003;96:1625-30. Vernon DT, Schulman JL, Foley JM. Changes in children's behavior after hospitalization. Some dimensions of response and their correlates. Am J Dis Child 1966;111:581-93. Uezono S, Goto T, Terui K, Ichinose F, Ishguro Y, Nakata Y, et al. Emergence agitation after sevoflurane versus propofol in pediatric patients. Anesth Analg 2000;91:563-6. Doyle WL, Perrin L. Emergence delirium in a child given oral midazolam for conscious sedation. Ann Emerg Med 1994;24:1173-5. Aono J, Ueda W, Mamiya K, Takimoto E, Manabe M. Greater incidence of delirium during recovery from sevoflurane anesthesia in preschool boys. Anesthesiology 1997;87:1298-300. Cohen IT, Hannallah RS, Hummer KA. The incidence of emergence agitation associated with desflurane anesthesia in children is reduced by fentanyl. Anesth Analg 2001;93:88-91. Cohen IT, Finkel JC, Hannallah RS, Hummer KA, Patel KM. The effect of fentanyl on the emergence characteristics after desflurane or sevoflurane anesthesia in children. Anesth Analg 2002;94:1178-81. Murray DJ, Cole JW, Shrock CD, Snider RJ, Martini JA. Sevoflurane versus halothane: Effect of oxycodone premedication on emergence behaviour in children. Paediatr Anaesth 2002;12:308-12. Silva LM, Braz LG, Módolo NS. Emergence agitation in pediatric anesthesia: Current features. J Pediatr (Rio J) 2008;84:107-13. Tesoro S, Mezzetti D, Marchesini L, Peduto VA. Clonidine treatment for agitation in children after sevoflurane anesthesia. Anesth Analg 2005;101:1619-22. Kararmaz A, Kaya S, Turhanoglu S, Ozyilmaz MA. Oral ketamine premedication can prevent emergence agitation in children after desflurane anaesthesia. Paediatr Anaesth 2004;14:477-82. Karen H. Pentazocine. Update Anaesth 2008;24:8-12. Chen J, Li W, Hu X, Wang D. Emergence agitation after cataract surgery in children: A comparison of midazolam, propofol and ketamine. Paediatr Anaesth 2010;20:873-9. Ko YP, Huang CJ, Hung YC, Su NY, Tsai PS, Chen CC, et al. Premedication with low-dose oral midazolam reduces the incidence and severity of emergence agitation in pediatric patients following sevoflurane anesthesia. Acta Anaesthesiol Sin 2001;39:169-77. Cohen IT, Drewsen S, Hannallah RS. Propofol or midazolam do not reduce the incidence of emergence agitation associated with desflurane anaesthesia in children undergoing adenotonsillectomy. Paediatr Anaesth 2002;12:604-9. Aouad MT, Nasr VG. Emergence agitation in children: An update. Curr Opin Anaesthesiol 2005;18:614-9. Cole JW, Murray DJ, McAllister JD, Hirshberg GE. Emergence behaviour in children: Defining the incidence of excitement and agitation following anaesthesia. Paediatr Anaesth 2002;12:442-7. Kain ZN, Mayes LC, Wang SM, Caramico LA, Hofstadter MB. Parental presence during induction of anesthesia versus sedative premedication: Which intervention is more effective? Anesthesiology 1998;89:1147-56. McGraw T, Kendrick A. Oral midazolam premedication and postoperative behaviour in children. Paediatr Anaesth 1998;8:117-21. Arai YC, Fukunaga K, Hirota S. Comparison of a combination of midazolam and diazepam and midazolam alone as oral premedication on preanesthetic and emergence condition in children. Acta Anaesthesiol Scand 2005;49:698-701. Thurston TA, Williams CG, Foshee SL. Reversal of a paradoxical reaction to midazolam with flumazenil. Anesth Analg 1996;83:192. Sikich N, Lerman J. Development and psychometric evaluation of the pediatric anesthesia emergence delirium scale. Anesthesiology 2004;100:1138-45. Przybylo HJ, Martini DR, Mazurek AJ, Bracey E, Johnsen L, Coté CJ, et al. Assessing behaviour in children emerging from anaesthesia: Can we apply psychiatric diagnostic techniques? Paediatr Anaesth 2003;13:609-16. Bauchner H, Vinci R, Waring C. Pediatric procedures: Do parents want to watch? Pediatrics 1989;84:907-9.